Acid reflux or Heartburn, as it is commonly called, is an unpleasant sensation in the upper abdominal & chest area & sometimes in the region of the heart, that occurs when gastric acid from the stomach rises up into the oesophagus (food pipe). 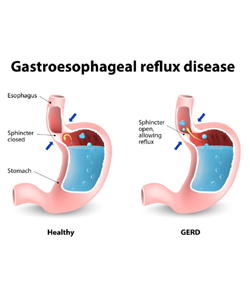 It is also known as acid indigestion or Gastroesophageal Reflux Disease (GERD). The symptoms may extend to the throat where it causes a burning pain, sore throat, cough and irritation. Pain or discomfort in the lower chest or upper abdominal area, particularly while bending, lying down or eating. Sensation of fullness, bloating, and abdominal pressure. Acidic or sour taste at the back of the throat. Feeling of irritation and soreness in throat accompanied by a cough. Avoid fatty & spicy food. Junk food tends to be high in these. Avoid stress and practise stress relieving routines like yoga & meditation. Avoid exercise immediately after eating. Avoid eating large quantities of food in one sitting. Instead, eat small quantities at regular intervals. Consume food slowly, chew & swallow it well. Avoid sleeping immediately after eating. A gap of at least 3-4 hrs is ideal. Try changing your sleeping position. Lying on the left side aids digestion. Avoid consumption of excessive chocolate or caffeine. Wear relaxed fitting clothes, especially around waist & abdomen. Drink required an amount of water during the day. Restrict water to only sips with meals to avoid bloating.